Countdown to 22nd annual Poppy Festival! At a press conference Monday, Lancaster Council Member Sandra Johnson gave a preview of what to expect at the 22nd Annual California Poppy Festival. LANCASTER – Camel rides and an all-kid cirque troupe are two of the new attractions attendees can expect when the California Poppy Festival bursts into bloom this year. 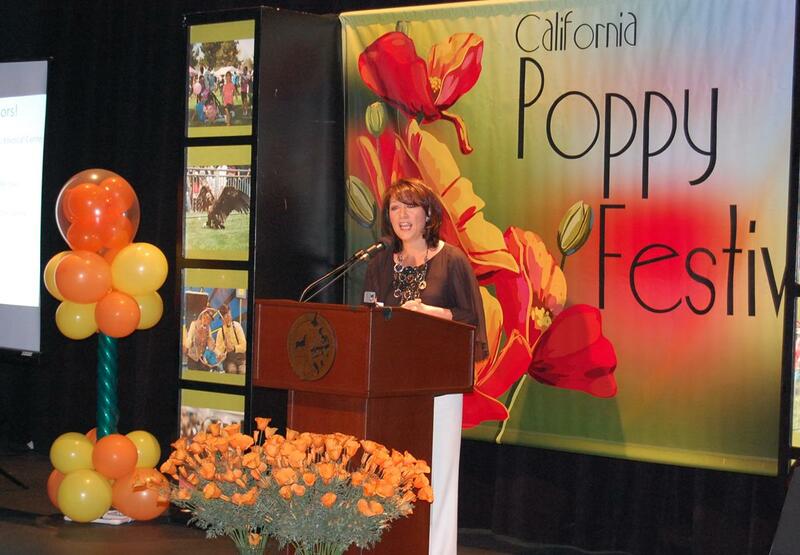 The 22nd Annual California Poppy Festival will take place from 10 a.m. to 6 p.m. on April 20 and 21 at Lancaster City Park, located at 43063 10th Street West in Lancaster. Organizers held a press conference Monday to detail what attendees can expect at this year’s festival. For a complete lineup of this year’s entertainment on the Poppy Stage, the Primrose Stage and the International Stage, visit http://poppyfestival.com/entertainment.php. “We have over 200 arts and crafts vendors, a huge children’s carnival, a wide variety of food vendors, which offers a huge amount of cuisines… a variety of rain forest animals and educational shows,” said Jeff Campbell, Operations Manager for the Parks, Recreation and Arts Department. Le PeTiT CiRqUe. The all-kid Cirque troupe (ages 7-14) from Los Angeles performs one of the most innovative and inspirational shows in North America. The performance will include Cirque Du Soleil’s IRIS star, Peter Linksy on trampoline. Kyra Sundance & Jadie. Featured on Jay Leno, The Ellen DeGeneres Show, and numerous NBA half-time shows, Jadie is a talented pooch who recognizes numbers up to 15. With her owner, Kyra Sundance, Jadie will perform three precision acrobatic stunt shows per day. Classic Car Show. Hosted by All Things Engravable on Sunday, the car show has been expanded to feature more than 100 classic automobiles. 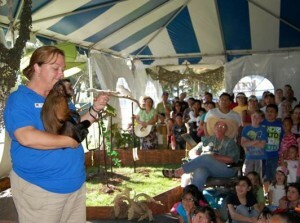 Safari Adventure – Live Rainforest Experience. Attendees will see more than 40 exotic animals, such as African porcupines, tarantulas, millipedes, sloths, tropical parrots, monkeys, hedgehogs, alligators, pythons, tortoises, carousel birds and more. Jest In Time Circus. Topper Todd and Li Li Zucchini will combine juggling, tight-wire walking, physical and verbal comedy into a dynamic show. Taste of Lancaster. The Taste of Lancaster returns for the fourth year. Various restaurants will offer fare ranging from ethnic selections to pasta and pizza, to treats such as cupcakes. The Taste of Lancaster will take place both days of the festival, with seating times from 11 a.m. to 1 p.m. and from 2 p.m. to 4 p.m. For $5, participants will receive 10 tickets (one sample per ticket). A beer tasting area will also be on site on Saturday only. Separate tickets may be purchased for beer tasting at $3 for two tickets (one sample per ticket).